Everyone has their favorite James Bond; most of us who grew up in the '70s and '80s are still divided over Sean Connery and Roger Moore. (Which is a ludicrous debate, of course: Connery, with his rough-and-tumble bare-knuckle brawling and Super Brow could wipe the floor with Moore.) The younger folk might remember Pierce Brosnan's respectable suavity in the '90s, and most seem to agree that Daniel Craig brought some fresh pathos and great abs to the role in the new century. The consensus tends to be that our favorite Bond is the always one we saw first. As movie people, we sometimes forget that Bond started in, uh, books. But in addition to novels and films, Bond was also... a daily comic strip. In fact, James Bond's comic strips debuted in 1957 in the UK newspaper The Daily Express, five years before the first Bond flick (Dr. No), and ran until early 1983. In 1957, Ian Fleming gave his reportedly guarded blessing to The Daily Express, allowing them to transform his super spy into a daily comic. Who knows whether he was pleased with the result, but the strip ran for almost 30 years in England. Now, Bond fans on either side of the pond can read the long-running serial in three collected volumes, the latest of which just hit the shelves: The James Bond Omnibus: Volume 003. I'm a fan of daily comics and I've always liked the constant cliffhangers of serial storytelling. Before newspapers went extinct, I remember following the long-running adventures of Spider-Man. (The musty soap operas Mary Worth and Rex Morgan, M.D.? Not so much.) So I cracked opened this collection, looking forward to reading the seven novel-ish stories included, with sensational titles like "River Of Death," "The Golden Ghost," and "Double Jeopardy." Fun stuff, yes? Each one a full cinematic tale, broken down and told in three-panel bites. And with everything collected omnibusily, I wouldn't have to wait a day between each strip. But despite my love of all things British and all things retro, these fell a bit flat for me. It's not because I've been spoiled by exquisitely detailed art and layered storytelling of today's comic book artists, or because I only like to look at color pictures. I love classic black-and-white vintage comic art. And the art here meets all the requirements: the women have cone bras, the men have chiseled jawlines, and the action is plenty POW! enough for me. It's not the original writers' or artists' faults; the constraints of a British newspaper surely placed some big-time limitations. Collectors and fans of British comics or the original Fleming novels will probably appreciate this latest collection. Fans of movie Bond... not so much. 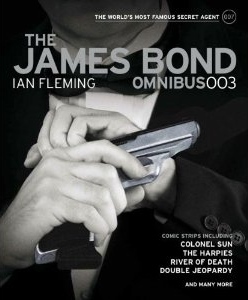 The James Bond Omnibus Volume 003 will be released on April 3, 2012.